As a result of consultation and feedback with hundreds of installers, Ideal Boilers has launched the next generation of its award-winning Vogue range of combi and system boilers. The Vogue GEN2 boiler features the latest technology, with premium components and a full-colour display. With installers firmly placed at the heart of the design process, the stylish new Vogue is a single piece unit and has been engineered to be as light as possible, with an insulated, lightweight chassis, giving it an overall weight reduction of 2.6kg, making it easy to position and quick to install. Vogue GEN2 features a simpler to use, high resolution customer interface with a fully backlit 3.5inch screen and rotary controls which are easy to operate. Additionally, cool burner door technology allows for servicing even if the boiler has been running and the pressure gauge has an easier to read font. Alongside the launch of the Vogue GEN2 is the introduction of the new Ideal filter. 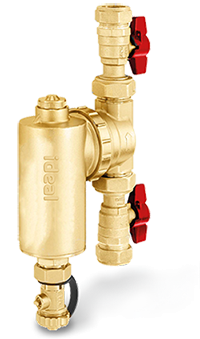 The forged brass Ideal System filter is small, smart and simple, fitting on to vertical or horizontal pipework. Interested in learning more about the Ideal Vogue GEN2?